For more in depth information about your local conditions, visit Plant Maps and enter your zip code. Homesteaders in Zone 1 endure a long, dark winter with extreme conditions. Livestock will need a draft free barn with plenty of bedding and extra attention to keep them healthy. The extra care and feed necessary for livestock may negate the benefits of keeping them. Chickens, with their small body size and susceptibility to frostbite, may not survive well in this zone without supplemental heat. Consider keeping a heavy breed of duck instead, as they have more body fat. Homesteading activities in winter are limited and may include trapping, hunting, and splitting firewood. 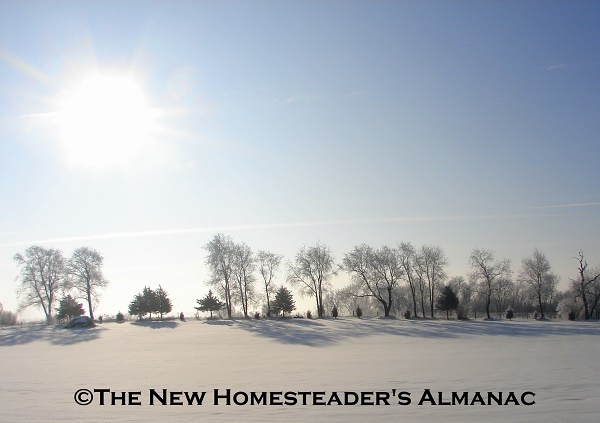 Homesteaders in Zone 2 endure a long, dark winter with extreme conditions. Livestock will need a draft free barn with plenty of bedding and extra attention to keep them healthy. The extra care and feed necessary for livestock may negate the benefits of keeping them. Poultry, with their small body size and susceptibility to frostbite, may not survive well in this zone without supplemental heat. Consider keeping a heavy breed of duck instead, as they have more body fat. Homesteading activities in winter are limited and may include trapping, hunting, and splitting firewood. Homesteaders in Zone 3 endure a long winter with extreme conditions. Livestock will need a draft free barn with plenty of bedding to keep them healthy. Poultry, with their small body size and susceptibility to frostbite, will need a draft free coop and may need supplemental heat. Consider keeping a heavy breed of duck instead, as they have more body fat. Homesteading activities in winter may include trapping, ice fishing, and splitting firewood. Homesteaders in Zone 4 may experience extreme weather conditions. Homesteading activities in winter are limited during periods of extreme cold. Small livestock, such as poultry, will need a draft free barn with plenty of bedding and some extra feed to keep them healthy. Homesteading activities may include ice fishing, preparing for sugaring season, and splitting firewood. 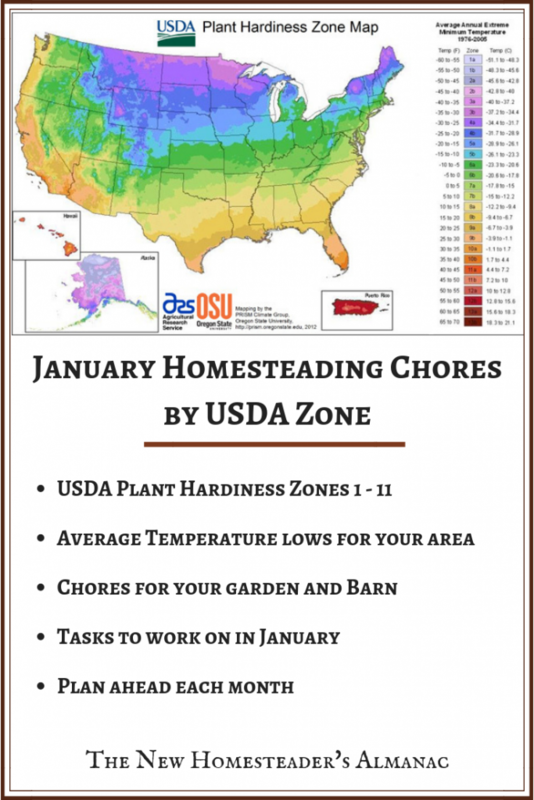 Homesteaders in Zone 5 may experience extreme weather conditions. 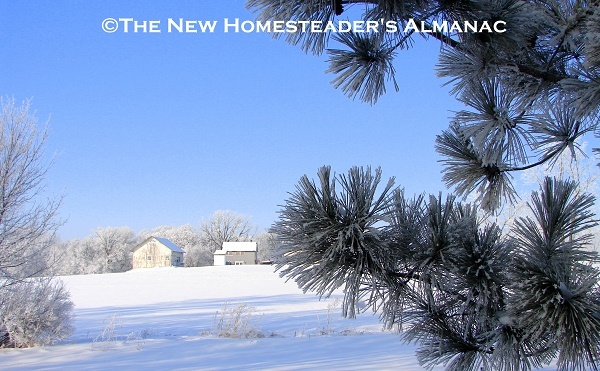 Homesteading activities in winter are limited during periods of extreme cold. Small livestock, such as poultry, will need a draft free barn with plenty of bedding and some extra feed to keep them healthy. 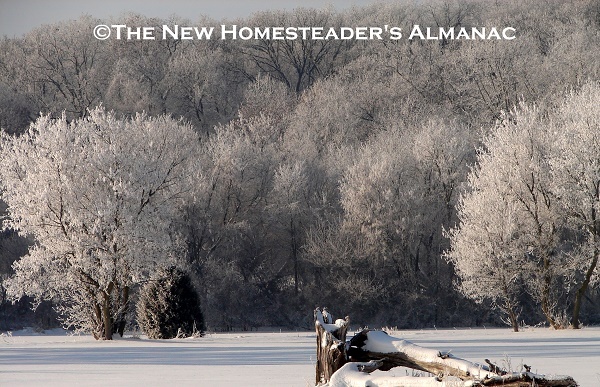 Homesteading activities may include ice fishing, butchering livestock, checking fence lines, preparing for sugaring season, and pruning fruit trees. Homesteaders in Zone 6 may experience extreme weather conditions. Poultry are susceptible to frostbite and should have a draft free roost overnight. Pruning trees and shrubs to remove damaged and weak growth should be a homesteading priority this month. Other homesteading activities include checking fence lines for repairs, butchering livestock, preparing for livestock birthing, collecting sap and making maple syrup when sap is running, repairing farm implements for spring planting, and starting some flower and vegetable seeds indoors. Homesteaders in Zone 7 may experience extreme weather conditions. Poultry are susceptible to frostbite when temperatures drop below freezing and should have a draft free roost overnight. Pruning trees and shrubs to remove damaged and weak growth should be completed this month. Planting garden seeds indoors begins in earnest this month, as well as cleaning and preparing garden beds. Preparing for baby livestock will also be a priority. Homesteaders in Zone 8 may be harvesting cool season crops from protected beds. Poultry should have a draft free roost overnight. Finish pruning trees and shrubs to remove damaged and weak growth this month. Planting flower and vegetable seeds indoors should be underway. Prepare garden beds when conditions allow. 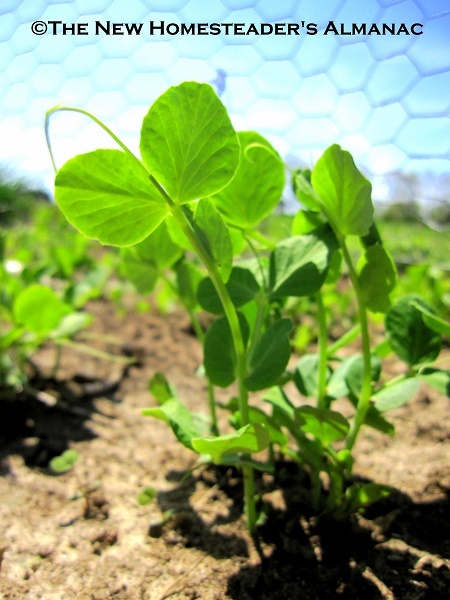 Cool season crops may be direct seeded in cold frames or low tunnels. Be prepared to cover plants to protect from frost. Take care of young animals and livestock due to give birth. Begin incubating eggs and set up brooders for newly hatched poultry. Homesteaders in zone 9 may be harvesting lettuce, spinach, and other cool season crops. New plantings may be started for the last of the cool weather crops. Warm season vegetables should be started under lights. Young livestock should be cared for in inclement weather. Homesteading activities may include foraging for wild foods, fishing, planting early crops, and raising young livestock. Tender plantings need to be protected if frost threatens. Homesteaders living in zone 10 should be prepared to cover tender crops if frost threatens. Cool season crops may be harvested and replaced with another planting of lettuce, spinach, kale, early cabbages, turnips and other cool season crops. Warm season flowers and vegetables should be growing under lights indoors. 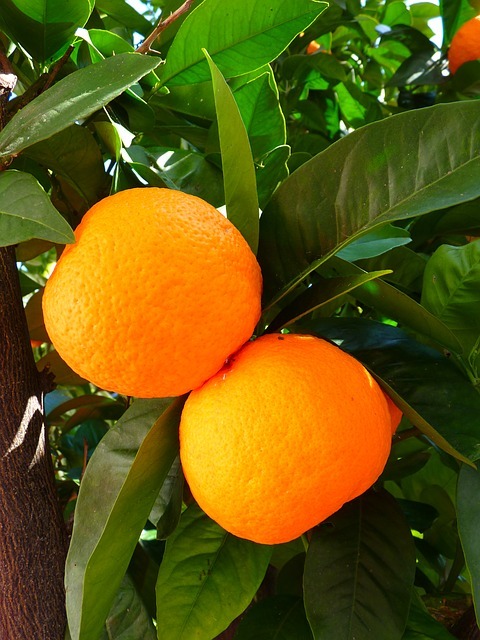 Citrus fruits may be harvested and new citrus trees planted. Watch for signs of pests and disease on crops. Potted plants may be moved outdoors on warm days. Homesteaders in zone 11 are able to grow heat loving tropical plants without concern for freezing temperatures. Cool season crops may be harvested and direct seeded in areas that remain cool, such as in shady beds. Tender seedlings of warm season flowers and vegetables may be hardened off, but be prepared to bring in on cold nights. Garden beds should be prepared and ready to plant. Citrus may be harvested and new citrus trees planted.